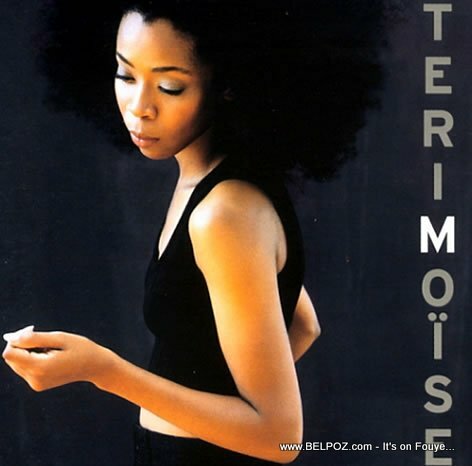 A young Haitian-American singer, Teri Moise, has committed suicide at a hotel room in Madrid Spain earlier this month. It wasn't until a week later that the media learned about her death. 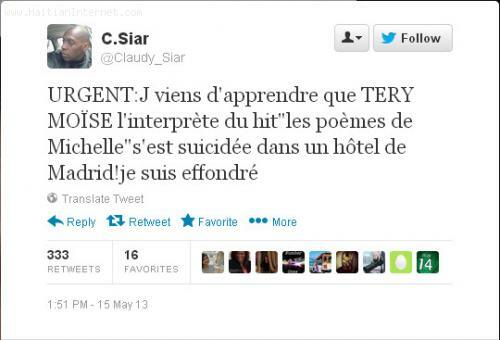 Teri apparently killed herself on May 7 2013 but her death was not known to the public until May 15 when Claudy Siar, director of Paris radio Tropiques FM tweeted his disbelief having just learned the news. Claudy Siar was looking for Teri for over a month to invite her as a guest in his television program. Born to Haitian parents in Los Angeles California on March 23, 1970, Teri Moise was best known for her song "Les poèmes de Michelle." She left Los Angeles in her twenties to live in Paris. "TERI MOÏSE : j'aimais la femme, l'artiste, je suis meurtri de constater dans quelle circonstance Teri a quitté la scène de la vie..."
« Is Haiti a place where you are NOT allowed to give credit? Wish I could reach out to the family. She was always such a strong and competitive person. When we raced she was always the fastest, learning the smartest, joking the wittiest. What a beautiful voice, What a beautiful woman. So sad. She must have been hiding so much pain. My heart goes out to you and your family sweetheart. So sad!!! It is very important this day of age we stay in the words and put God first in everything we do because the devil is at work but our God is more powerful then him. Again it is so sad to hear I will pray for her family and friends for their healing.